You may have caught a similar clip on the KGMB9 Evening News! Here is an excerpt from blog written by Peter Liu that features the kids and the SMS volunteers! 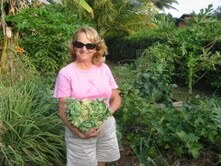 Earlier this week, South Maui Sustainability held a Harvest Day Party at their Kihei Elementary School Garden. Volunteers Chef Nio Kindla, Kathy Becklin, Susan Wyche and Stuart Karlan led Ms. Manglicmot’s 19 eager kindergarten students around the garden and showed them how to harvest their own vegetables. As the Earth Day 2010 events wind down, it is fitting that Teri Leonard is recognized as our Volunteer of the Month. Since founding the Reef Sustainability Committee last year, Teri has created, sponsored and supported many events based on environmental issues. She has been involved with Beach and Highway Clean-ups, Fish Identification classes and surveys, water quality monitoring programs, and was recently invited to be a member of the South West Maui Watershed Project Advisory Board Steering Committee. She was the organizer of our April event where 4 speakers, including herself talked about our environment and the impacts and threats. Teri is always enthusiastic about making sure people are educated and know actions that we can all take to make tomorrow better. Teri is the manager of Maui Dreams Dive Co. in Kihei where she has worked as a SCUBA instructor for more than 10 years. She continues to act as an advocate for the environment on the County, State, and Federal levels of government. Please join Teri as she moves forward with these projects and more in the coming year. Happy Birthday, SMS! 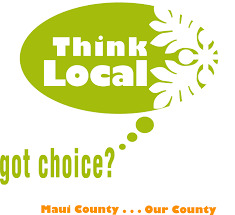 South Maui Sustainability just celebrated our 2nd year of working with the community to learn about and implement sustainable living practices. Thanks to everyone that has worked with us to forward this cause. You can find a list of a few of the little things we’ve accomplished in the new 1093 page book we are about to release on the subject. We look forward to publishing another tome on our 4th Anniversary. Contact Maury for more information. South Maui Bike Path As you may know, South Maui Sustainability is a member of the newly formed South Maui Bicycle Coalition. The coalition is working hard to get the long planned bike path along the North/South Collector Road corridor built. This could make a big change to the health and sense of community in South Maui, as well as a great way for kids to get to school. If you feel strongly about this issue, please come to the STIP (Statewide Transportation Improvement Program) Meeting in Kihei and make your feelings known. Join us at Kihei Elementary School Cafeteria on Tuesday, May 25, 2010 at 6:00 P.M.
June 10 – Join us for our 2 year Anniversary Party at Kamaole III beachpark from 5:30 – 7:30 PM. Bring a pupu to share, your favorite beverage, your own utensils and your mana’o and let’s enjoy an informal celebration of where we’ve been and where we’re going. One of the places we’re going is planning all our events as Trash Free. Look for the SMS canopy and banner. We decided to delay our Edible Garden Tour until fall. We are still looking for great gardens. We considered having just a gardening event at the Kihei School Garden but decided that it was getting too warm for people to enjoy! We are moving forward to be a part of the Adopt A Highway program, currently looking at the highway and area around Kealia Pond. We’ve already been having quarterly cleanups which we’ll continue. 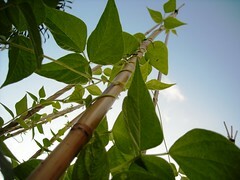 Make sure to check out Lono’s Bounty at http://vimeo.com/10686282. In this 78 minute film we explore the growing number of Hawaii farmers, advocates, chefs, artisans, urban gardeners, and families who are taking action by making themselves less reliant on outside forces, and actively supporting a trend toward sustainability. Ah – spring is in the air and the garden magazines and newspapers are telling you to get out in the garden and plant! But WAIT…we live in South Maui. Things aren’t quite the same because we can grow year round. However, when you look at seasonal planting guides for Hawaii, summer is actually the least productive. Many gardeners actually use the summer to let vegetable gardens go dormant. There are many good reasons to do this. Unless you have full shade, most lettuces will bolt before you’ve collected the first edible leaves. Pests seem to be in full force when it is hot and dry. A dormant field may cut down on soil-borne pests and diseases. Planting a cover crop is one way to minimize water use while enriching your soil. A few that are recommended in our sandy, alkaline soil are barley, woollypod vetch and sweetclovers. If you want to try to keep your garden up, make sure to rotate your crops, use organic fertilizers, mulch well and keep your plants hydrated. Remember that hot dry winds may cause plants to transpire resulting in limp leaves and dead-looking plants. When the cooler nights come, they’ll perk right back up. Although watering 2-3 times a day for short periods may help; it is important to check your soil to make sure you aren’t over-watering. If you are growing in pots, make sure to mulch well to keep the soil cool. Some edibles that do well in the summer here include: Chives, Mint, Beans, Corn, Eggplant, Green Onions, Onions, Peppers, Squash, Sweet Potato and Taro. This column highlights little changes toward a more sustainable life. Each month we feature one small thing that you can do each day in just minutes. You may already be doing it so find ways to adapt and improve. Studies show that it takes about 20 days to establish a habit. By having a habit of the month, we are constantly establishing more sustainable lives.This month’s sustainable habit of the month is to conserve water. 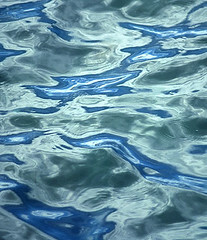 Fresh water is a precious resource on our arid side of the island. Conserving water also means less waste water to process and less water in our injection wells! Listed below are a few suggestions to make changes. Habits are changed slowly – so just pick one or two changes at a time to make a difference. Challenge your dishwasher more! Most modern dishwashers do a great job of cleaning without pre-rinsing . Just scrape off food. Most dishwashers use about 4 gallons of water during a cycle; the average person washing a full load of dishes by hand used 27 gallons of water. For hand washing, think the same way a dishwasher operates. Put as much dirty stuff as you can in one side of the sink and stop the drain but don’t fill with water. Spray everything down with hot soapy water then let it sit a minute or two. Rinse and repeat noticing any places that need scrubbing. Move all soapy dishes to the other side and rinse quickly. Check and Tune Your Sprinkler System Watering our landscaping is one of the biggest uses of water. Spend 5-10 minutes a day to observe, tweak and tune your sprinklers. Shortening a cycle by a few minutes can save gallons. Look for and repair any leaks; rats are known to chew through the drip line cables. And don’t forget to keep your soil healthy with proper organic amendments. Healthy soil allows more water to get into the plants! Mulch reduces the evaporation so more water is available to your plants. Also think about reducing your lawn area which uses tons of water. Shower Time If your shower is across the house from your hot water heater, try this tip. Get a timer and time how long it takes for hot water to flow. The first day, set the temperature where you like it. The second day, set it as hot as possible. See which one take less time (and has less water running down the drain) while you are waiting for hot water. If you are extreme, keep a bucket in the shower to collect the water. Install low flow shower heads; many newer models offer powerful feeling flow. And keep that timer in the shower to keep them as short as possible! Stop that Running Be aware of running water while brushing your teeth, washing your hands and cleaning. If you aren’t actively using the water; stop it. Every second counts! Tune up that Toilet If you are purchasing a new toilet get one of the new WaterSense rated ones. Although you may pay a little more you will make it back quickly. For existing toilets, watch for leaks! The county has bags that you put in the tank that cut down on water use. Recently, a dual flush valve became available that allows you to select your flush for #1 (low water use flush) and #2. Our April 8th monthly community event was very exciting! In honor of Earth Day, we invited several local speakers to share their expertise on various areas and issues of the South Maui Ahupua’a. Robin Knox, a respected water quality scientist, introduced the community to the South West Maui Watershed Project. The audience, as well as all community members, were encouraged to join in the project and have a say in the planning and design of the watershed. We were all fascinated by the presentation by Andrea Buckman, Project Coordinator for the Leeward Haleakalā Watershed Restoration Partnership. She shared her extensive knowledge of the native plant reforestation projects being conducted in the Ulupalakua area. There are plenty of volunteer activities if you’d like to get out and help see http://www.lhwrp.org and http://www.auwahi.org. Division of Aquatics Resources Maui Coordinator, Darla White presented the immense changes happening to our coral reef systems. Teri Leonard then shared, Gyre Project founder, Rich Owen’s program regarding the huge ocean areas full of plastic and how there is hope that we may be able to reverse the problems. The evening finished with an informative Q&A session with all of the speakers. Mahalo to everyone who took the time to attend and we hope to see you at our next community event. On Earth Day, April 22nd, the Reef Committee spent the morning at Ulua Beach in Kihei. We talked story with the beachgoers about water quality and visual monitoring techniques. Many people had good questions about the quality of the water and were curious about the various possible sources of pollution. We are looking forward to future water monitoring events which will focus on public involvement and training.